Rather to the Open Movie Night!? The first day of the event is closing. One has received many suggestions, learned new and exciting ideas and met nice people. Where do we go from here? Do we want to go home, to the gym or to the youth hostel? Again in this year Linux won't take a break and keeps moving on to the Linux Night which is planned to take place on 6pm right after the lectures and workshops. The Linux Night is the attempt to temporally bridge between a two-day event. It provides some opportunities for discussions that haven't been finalised during the day. There is no pre-defined social program. It's your decision what the night will bring. Non-residents of Chemnitz who don't know the city can spend some enjoyable hours in good company with like-minded people. The goal of the Linux Night is to sustainably reinforce the short-time contacts that were socialised on the Chemnitzer Linux-Tage. Where will the Linux Night take place? 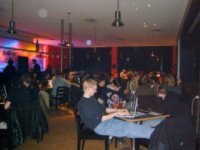 The Linux Night will take place in the "Treff am Campus", a student union opposite the conference building (signs will be provided). This union opens its doors for free shortly after the end of the lectures on the first day. An admission ticket for the Chemnitzer Linux-Tage is not required. As it is customary for student unions beverages can be purchased at agreeable prices. For those who are hungry and don't want to confine themselves to liquid nutrition we offer a pizza proxy. On the Linux Night you will find tables, chairs, a data network and electricity as well as a stage and a projector for a large audience. All remaining hardware particular computers have to be brought by yourself. Why should I go to the Linux Night? The so-called pizza proxy has found keen interest during the last years which is why it will be offered again this year. For this purpose we collect your pizza orders and send them bundled to the delivery service. You just need to pay us, we order and distribute the pizzas as soon as they arrived. We expect less chaos from this form of meal order. The service call times are scheduled for 7pm and 9pm however this can change depending on the demand. The registration of Ligthning-Talks and marketplace presentations is now available.